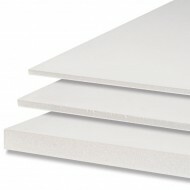 This economical, lightweight foamboard is made of a resilient extruded polystyrene foam core which is laminated on both sides with paper. Available in 3mm (1/8'') and 5mm (3/16'') thickness. Commonly used to produce architectural models, prototype small objects and patterns for casting. It is also often used by photographers as a reflector, in the design industry to mount presentations of new products and in picture framing as a backing material.